The season started with 2 away trips against Everton and Newcastle United. The former match ended 3-2 in our favour. It wasn't the best of starts and I was beginning to wonder whether our poor showing in the friendlies would be an indication of this year's title hopes. But my team had other ideas when Newcastle United entertained us at Tyneside. Both Pires and Parlour were on the pitch. 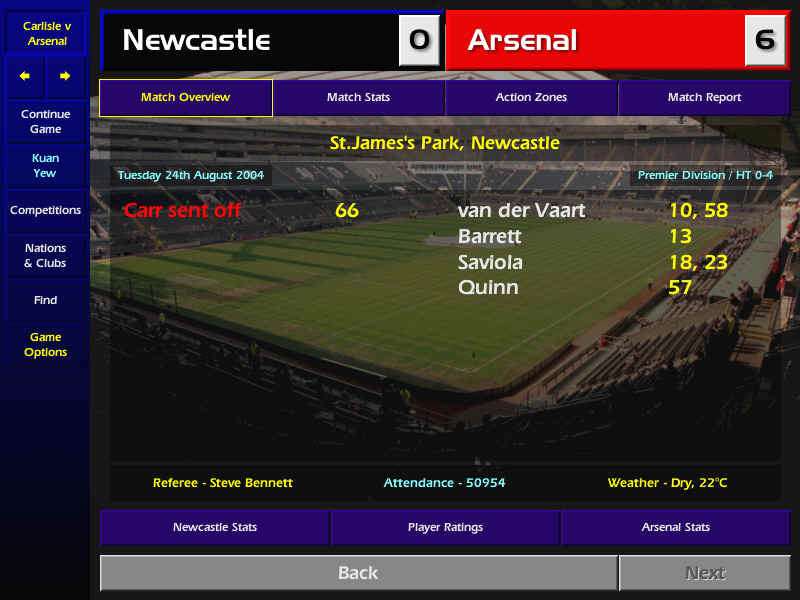 There was no love lost when we took the lead through Van der Vaart in the 10th minute. It was his first goal for Arsenal. There was no holding back the rampant Arsenal side as we swept to a 4-0 lead at half time. 2 more goals were added in the second half and the final score, a 6-0 drubbing of Newcastle United who had the service of 2 ex-Gunners. [ScreenShot] We followed it up with a hard-fought victory over Southampton. The Champions League Phase 1 group matches pitted us against the likes of Feyenoord, Monaco and Servette FC. It would be an easy group after I witnessed the draw at UEFA's headquarters in Geneva. The first match was away to Rotterdam against Feyenoord. A freak collision between Elmander and Janssen saw both of them being substituted. We took advantage of the situation to score a 2-1 win over them. 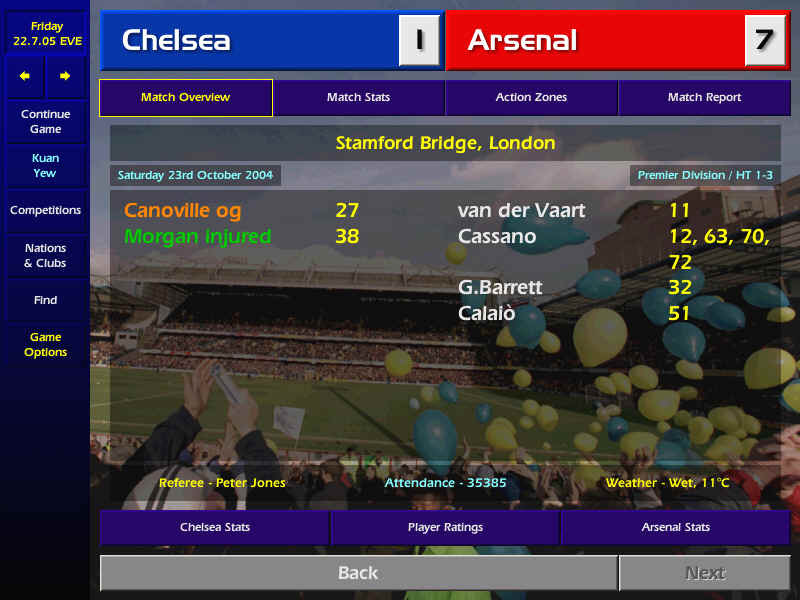 The next match was even easier as we faced Monaco who had Wiltord with them. He would be returning to familiar grounds at Ashburton Grove and the fans gave him a voracious salute for his 132 appearances and 63 goals for Arsenal during a 4-year period. Unfortunately he would be returning home empty handed after his team, Monaco was totally outplayed by us. 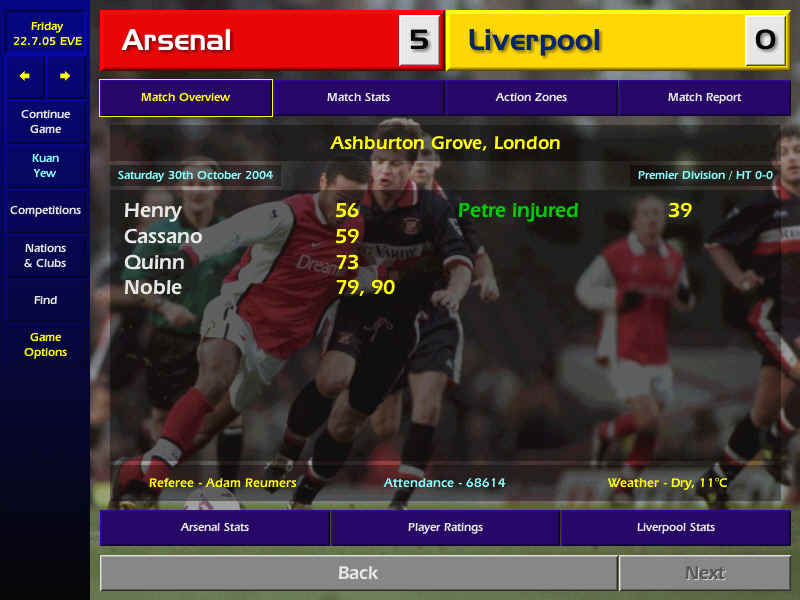 2 goals from Joe Cole and 1 each from Saviola, Vieira and Ljungberg gave us a 5-0 win. [ScreenShot] The match against Servette FC was an easy one as we cruised to a 4-1 win despite having Frey sent off for committing a professional foul. Back in the domestic front, I was awarded the Manager of the Month award for September and October after some clinical wins over a few top sides. Rafael Van der Vaart won the Player of the Month award for October. The shock of the season came when we faced Chelsea at Stamford Bridge. It was unbelievable! Chelsea had been runners-up in the league for 4 seasons already but this time around, they were dead and buried with just a quarter of games being played.